Whether it’s for a traditional wedding ceremony, an elopement, or a renewal of vows, Las Vegas is one of the world's most popular destinations for wedding events. Las Vegas itself is a city like no other. With unique attractions, world-class restaurants, and some of the most outlandish people and experiences, Las Vegas attracts people of all kinds from all around the world. But the fact that Vegas is an extremely popular wedding destination does not mean that you cannot have a unique wedding experience. Las Vegas wedding venue will offer a full range of packages, including bouquets and boutonnieres, the officiant, champagne, photography, entertainment and more. If you dig deeper, you can find some unique themes and venues for your special day. Here are some great unique Las Vegas wedding venues and ideas. Caesar’s Palace offers several different wedding packages that can accommodate an intimate group of 35 up to a larger group of 196, depending on the wedding party size. But for those who seek a unique Caesar's wedding experience, couples may get married in the Venus Garden, surrounded by tropical palm trees, a floral landscape, and Roman architecture (with seats for up to 114 guests). Caesar’s Palace also offers another outdoor setting in the Juno Garden, which offer the ultimate in luxurious escapes and seats up to 128 guests. The Flamingo, a spectacular Caesar's sister hotel, offers several quaint and picturesque wedding locations on its15 acres of secluded garden property. Options include a traditional indoor wedding venue, an outdoor pool, waterfalls, and lawn. One unique package available at the Flamingo is the Gazebo Package, which takes place in a secluded setting that offers twelve-foot trees and white trellised archways. Those beautifully intimate, it can still seat up to 100 guests. The Flamingo also offers “Live Weddings,” an online streaming video that allows those who may not be able to see the couple in person. No wedding list of Vegas wedding venues would be complete without including the Graceland Wedding Chapel. The Graceland Chapel has been a part of the Las Vegas strip for over 50 years and offers both traditional wedding options and all-out Elvis theme packages that include Elvis performances, Elvis officiants, or even Elvis giving away the bride. A favorite among celebrities, the Graceland chapel offers Elvis fans an unforgettable experience. Mandalay Bay’s wedding venues are all located by its 11-acre pool and include three different chapels that can accommodate either 50 or 100 guests. With 12 different wedding packages, Mandalay Bay offers its traditional chapel environments, but also some unique venue options in Vegas. Specialty wedding packages include a ceremony that takes place in its Shark Reef or a Cabana Ceremony package that takes place outdoors and includes ​the use of a cabana for the day. The Sun Villa Ceremony package also provides couples with the use of their own outdoor villa for the day. For those couples who can’t decide among the various options on land along the Vegas strip, there’s always the sky. Maverick Helicopters offers a wedding package that allows couples to get married while flying over the Las Vegas strip or surrounding desert scenery. The only drawback to this is the limited number of guests in the helicopter: bride and groom plus up to three guests (weight permitting). Paris Las Vegas wedding package options include two different French-opulent chapels: the Chapelle du Paradis which holds up to 90 guests and the Chapellete du Jardin which holds up to 30 guests. The Paris also offers a less formal poolside cabana wedding package. But the most unique wedding setting at the Paris is its Eiffel Tower Observation Deck which stands high at 460 feet above the famous Las Vegas Strip. Available for a daytime or nighttime ceremony, the Eiffel Tower observation deck is a unique venue, and is only limited to 12 guests. Treasure Island offers a dozen different wedding packages, including chapel options, but the most unique and notable is the Enchantment Wedding Ceremony. It takes place on the Sirens’ ship located in Sirens’ Cove with the ship’s very own captain performing the ceremony as a pirate swings down from the crow’s nest to deliver the wedding rings. The ship is also where Treasure Island also holds its outdoor production, The Sirens of TI®. Treasure Island also offers “Live Weddings,” an online streaming video that allows those who may not be able to see the couple in person. 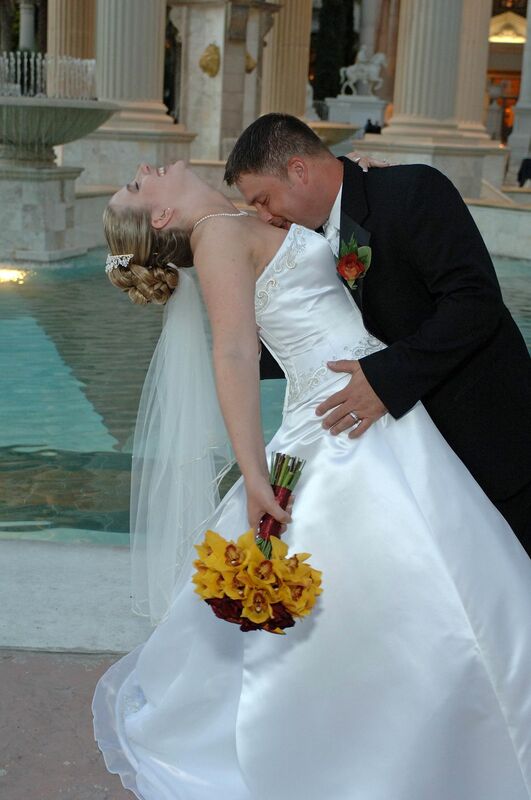 The Venetian offers Italian-themed weddings, including nine different wedding packages. Its traditional chapel has seating for up to 140 and may be divided for smaller sized groups. There’s also an outdoor wedding terrace that accommodates up to 50 guests. But two of the most unique Vegas wedding venues exist at the Venetian: Pont al di Piazza, which takes place over a bridge that is reminiscent of beautiful city of Venice and the Ceremonia Sul’ Aqua, or Ceremony on Water, which takes place aboard an authentic Italian gondola as it glides through the water surrounding the hotel. The wedding couple floats while their gondolier serenades them. For those who want a uniquely stylish Las Vegas affair, the Wynn Las Vegas offers beautiful wedding salons and elegant wedding packages that all include a dedicated wedding consultant. The most unique ceremony space the Wynn offers is the Tranquility Hall in The Spa at Encore, which offers one of the most beautiful and luxurious locations for your vows and champagne toast.